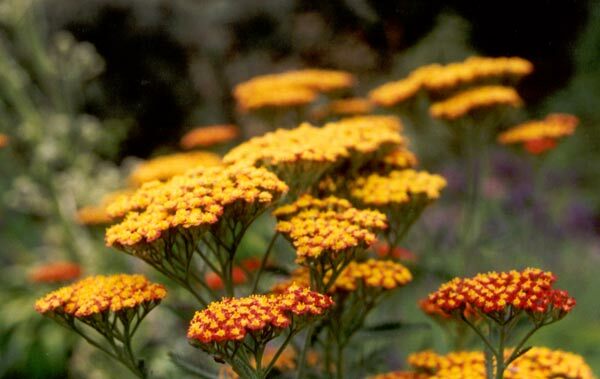 When you look at the flowers of Achillea Feuerland close-up you'll see that the overall colour effect comes from small separate colours, red and yellow. I bought this stunning Achillea by mail order - actually I was typically impatient and bought three plants. When the rugosa rose border by the Hen House was dug out to its limit, this Achillea was one of the prime summer perennials. The photograph below was taken in the summer of 1998. I like the fact that it looks like a burnt orange terracotta colour mix (from a distance). Unfortunately as this border matured the neighbouring lavender got a bit pushy - by summer 2004 there was only a small, sad patch of Achillea left. 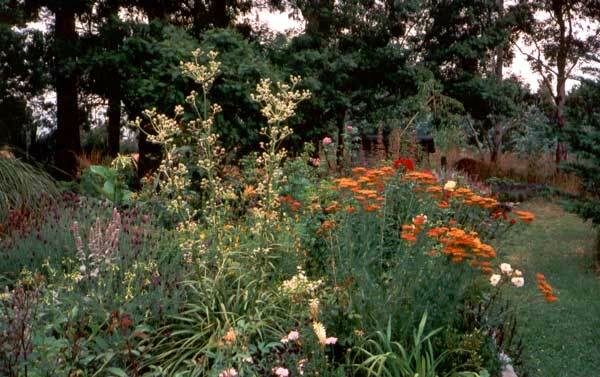 This winter I intend to rescue and replant - using this picture as my inspiration!